WASHINGTON, December 7. /TASS/. Russia should return to compliance with the Intermediate-Range Nuclear Forces (INF) treaty by either scrapping its 9M729 missile system (NATO reporting name SSC-8) or altering it in a verifiable manner, US Under Secretary of State for Arms Control and International Security Andrea Thompson said on Thursday. The Department of State official once again reiterated the demand to Russia to get back "to full and verifiable compliance". "The SSC-8… has the range that's not in compliance, so either you rid the system, rid the launcher or change the system or it doesn't exceed the range," she told reporters during a conference call. "And that and only that would go ahead and let them be and verifiable, to have eyes on that once that occurs," the US diplomat went on. "But again, to reiterate, the ball is in in Russia's court. We we can't do that for them, they have to take that that initiative." According to Thompson, the United States has informed Russia about the steps it expects from Moscow. "There's a series of next steps we have we've outlined that Russia knows what those are, and we do as well. It's part of the treaty provisions when we signed when we signed the INF. We've got interagency process taking next steps," she said. According to the official, the US administration was looking into a number of scenarios, suggested by some members of the arms control community for solving the issue. One of those includes Russian inspections of the US Aegis Ashore systems and their possible modification so it couldn't fire Tomahawk missiles. Russia, in its turn, could permit an inspection of the ground-launched 9M729 cruise missile and maybe make modifications so that its range would be more limited. The INF Treaty was signed in Washington on December 8, 1987, and took effect on June 1, 1988. 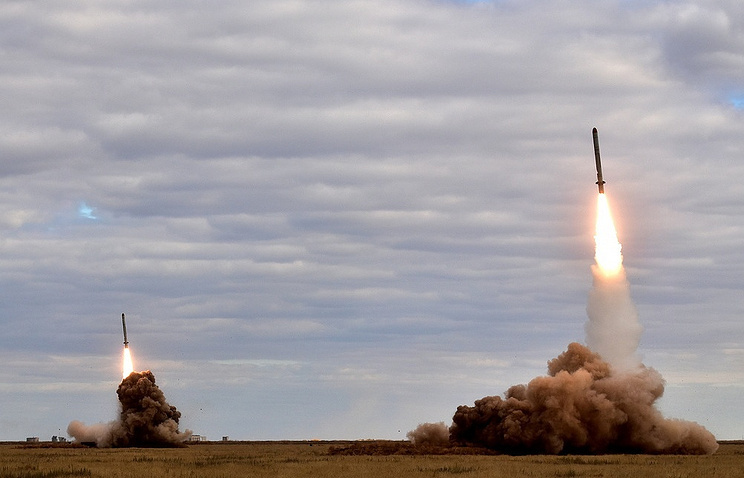 The INF Treaty eliminated operational and non-operational medium range (1,000-5,500 kilometers) and shorter range (500-1,000 kilometers) ground-launched missiles. By June 1991, the Soviet Union had eliminated 1,846 missiles, while the United States rolled back its arsenal to 846. That said, inspections ended in May 2001. Back in July 2014, Washington accused Moscow for the first time of violating the INF Treaty. Since then, the US has repeated this claim more than once. Russia strongly dismissed the accusations and struck back at the US with counterclaims, saying the United States also has been blatantly violating the treaty by deploying at its bases in Europe multi-purpose Mk-41 vertical launching systems, which can also be used to launch Tomahawk cruise missiles. Besides, Russian Deputy Defense Minister Col. Gen. Alexander Fomin said in mid-August that Washington had made a decision earlier this year to finance a project to build mobile launching systems for land-based cruise missiles with the range of 500-5,500 km, which also fall under the treaty’s limits. On December 4, US Secretary of State Michael Pompeo said after the meeting of NATO defense ministers that his country would stop honoring its commitments under the treaty, if Russia fails to return to compliance with that accord within 60 days. Russian President Vladimir Putin replied on December 5 that Washington has failed to present any evidence of Russia’s non-compliance. He added that although Moscow would like to have the treaty preserved, it would adequately respond if the US chooses to terminate it unilaterally.